With an area of 2,700,000 square kilometres (1,000,000 sq mi) – equivalent in size to Western Europe – Kazakhstan is the ninth-largest country and largest landlocked country in the world. While it was part of the Soviet Union, Kazakhstan lost some of its territory to China’s Xinjiang autonomous region and some to Uzbekistan’s Karakalpakstan autonomous republic. It shares borders of 6,846 kilometres (4,254 mi) with Russia, 2,203 kilometres (1,369 mi) with Uzbekistan, 1,533 kilometres (953 mi) with China, 1,051 kilometres (653 mi) with Kyrgyzstan, and 379 kilometres (235 mi) with Turkmenistan. Major cities include Astana, Almaty, Karagandy, Shymkent, Atyrau and Oskemen. It lies between latitudes 40° and 56° N, and longitudes 46° and 88° E. While located primarily in Asia, a small portion of Kazakhstan is also located west of the Urals in Eastern Europe. 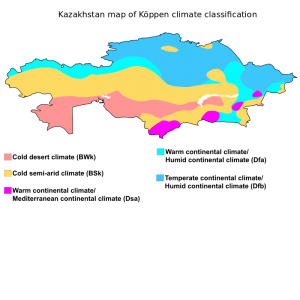 Kazakhstan’s terrain extends west to east from the Caspian Sea to the Altay Mountains and north to south from the plains of Western Siberia to the oases and deserts of Central Asia. The Kazakh Steppe (plain), with an area of around 804,500 square kilometres (310,600 sq mi), occupies one-third of the country and is the world’s largest dry steppe region. The steppe is characterised by large areas of grasslands and sandy regions. Major seas, lakes and rivers include the Aral Sea, Lake Balkhash and Lake Zaysan, the Charyn River and gorge and the Ili, Irtysh, Ishim, Ural and Syr Darya rivers. 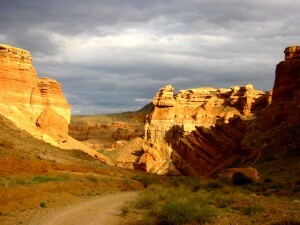 The Charyn Canyon is 80 kilometres (50 mi) long, cutting through a red sandstone plateau and stretching along the Charyn River gorge in northern Tian Shan (“Heavenly Mountains”, 200 km (124 mi) east of Almaty) at 43°21′1.16″N 79°4′49.28″E. The steep canyon slopes, columns and arches rise to heights of between 150 and 300 metres (490 and 980 feet). The inaccessibility of the canyon provided a safe haven for a rare ash tree Fraxinus sogdiana that survived the Ice Age and is now also grown in some other areas. Bigach crater, at 48°30′N 82°00′E, is a Pliocene or Miocene asteroid impact crater, 8 km (5 mi) in diameter and estimated to be 5±3-million years old. The climate is continental, with warm summers and cold winters. Indeed, Astana is the second coldest city in the world after Ulaanbaatar. Precipitation varies between arid and semi-arid conditions. 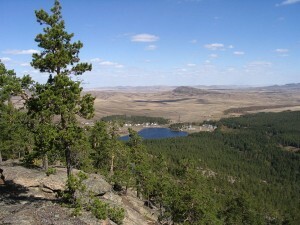 There are ten nature reserves and ten national parks in Kazakhstan that provide safe haven for many rare and endangered plants and animals. Common plants are Astragalus, Gagea, Allium, Carex and Oxytropis; endangered plant species include native wild apple (Malus sieversii), wild grape (Vitis vinifera) and several wild tulip species (e.g.. Tulipa greigii) and rare onion species Allium karataviense, also Iris willmottiana and Tulipa kaufmanniana. Common mammals include the wolf, red fox, corsac fox, moose, argali (the largest species of sheep), Eurasian lynx, Pallas’s cat, and snow leopards, several of which are protected. 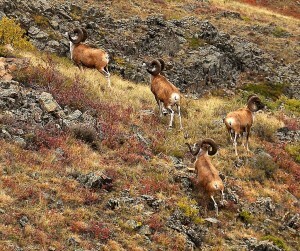 Kazakhstan’s Red Book of Protected Species lists 125 vertebrates including many birds and mammals, and 404 plants including fungi, algae and lichen. The cities of Almaty and Astana have status “state importance” and do not belong to any region. The city of Baikonur has a special status because it is being leased until 2050 to Russia for the Baikonur cosmodrome. Each region is headed by an akim (regional governor) appointed by the president. Municipal akims are appointed by region akims. Kazakhstan’s government relocated its capital from Almaty, established under the Soviet Union, to Astana on 10 December 1997. 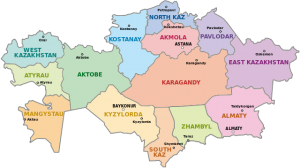 A clickable map of Kazakhstan exhibiting its 14 regions.